Uncle Rod is not yet over the hill, but he is approaching the crest. There is no denying some things are harder as late middle age beckons. Like sea trials. Saturday before last I wanted to be out at the dark site snatching Herschel objects with wild abandon with the aid of my Mallincam Xtreme. Not to be, muchachos; instead I was sitting in a motel room in Avondale, Louisiana. The first sea trial for the Navy’s newest amphibious transport ship, LPD 23, Anchorage, was set to begin the following Tuesday, and I would need to be onsite the preceding weekend to make sure the systems for which Unk is responsible—NAVSSI, Ship’s Control Systems, Radars, etc., etc.—were ready to go. When we hit the Gulf of Mexico I did get out under the stars on a bridge wing with binoculars a time or three, but that was all the observing I did weekend before last. The good news? We were out of the Gulf and back up the Mississippi last Friday morning, so it looked like I’d be able to make it to the dark site Saturday. The bad news? I was one tired puppy. At-sea stints are nothing new to me. I rode all but one of the Ticonderoga Class cruisers built in Pascagoula and all of the Aleigh Burke Class Aegis destroyers. ‘Course, what was “fun” in the 1980s, “OK” in the 1990s, and “bearable” in the oughts has become “barely survivable” in this new decade. I got through it, and my systems did fine, but, yeah, I was one tired canine by the time I got back to Chaos Manor South just before 10 p.m. Friday night. I wanted to head out to the club dark site. I insisted on going to the dark site, though my dear wife Miss Dorothy was a little skeptical. Honestly, I was a little skeptical, Part of one nice evening at home is hardly enough to wash away a week at sea. The idea of toting the C8, the Mallincam, the video gear, the computer, the batteries, and everything else I need for an Xtreme run did not have much appeal. I still wanted to go, though. The solution? Old Betsy, of course. I’ve told the story of Bets’ and my relationship before, most recently here. While I’ve had the Dobsonian since 1994 (in her original Meade body), our friendship has not always been the beautiful one it is now. After I went go-to a decade ago, Betsy sat unused for years. Yes, she was still the Big Gun in our house, with 12.5-inches of aperture, but the NexStar C11, Bertha, really didn’t give up much to her. That began to change one afternoon when my friend and Dob Guru Tom Clark (Tectron Telescopes) was visiting the Old Manse. He examined Betsy and pronounced, “Looks like a nice telescope. Shame you don’t use her.” That guilt trip got me to thinking, and the denouement was that I gifted the old girl with a Sky Commander digital setting circle computer, a higher quality and downsized secondary mirror, an AstroSystems secondary holder and heater, and a super duper primary mirror recoating job by Spectrum down in Florida. I won’t say I’ve used Betsy often since her upgrades, but I have used her enough to justify them. She was, in fact, the telescope that began The Herschel Project at the 2009 Deep South Regional Star Gaze, and her success there encouraged me to take on that scary H-2500 Whole Big Thing. While the NexStar 11’s images are comparable to Betsy’s, the Dob is quicker to set up and tear down since she doesn’t require all the support gear the SCT does. Betsy’s Sky Commanders, while not quite as accurate as Bertha’s go-to computer, are fully capable of putting any object from one side of the sky to the other in the field of a medium power eyepiece. On this particular Saturday I wanted to do Herschels, and I wanted to do them without busting a gut loading and setting up the telescope. That meant Betsy was on deck for Night 33. While not exactly a lightweight, she’s still easier to get in the 4Runner than the NexStar 11 in her huge case. Hell, she’s quicker to get back in the truck at the end of the night than the C8. While my eyes certainly can’t go as deep as the Xtreme, I figured I ought to be able to pull-in enough new H-2500 objects from the rapidly diminishing store of “still needed”—YEP, UNK IS COMING DOWN THE HERSCHEL HOMESTRETCH—to make the trip out to Tanner-Williams worth it. Whatever happened, I figured it would be fun, anyway, and I was due some fun. Come Saturday afternoon, I was in high spirits. The dadgum Weather Underground forecast had gone from “clear” to “partly cloudy,” but the sky still looked OK. There was some general haze, and there were some clouds, but the clouds were the fluffy afternoon sort that tend to scamper off at sundown. The only bad? We’re now at the point where sundown is getting noticeably later. Sol is not getting out of the way till dang near 8 o’clock, so I spent the afternoon cooling my heels and champing at the bit to get under a dark sky. At 6 p.m. I loaded the truck. Didn’t feel like using my checklist; just threw the stuff I thought Betsy would need in the 4Runner. What could happen? Well, not quite “threw.” Betsy has not lost any weight over the years, and it appears I’ve grown progressively weaker. In my reduced post sea trial condition, getting the mirror box down the front steps and into the Toyota was a pain—literally. Almost as bad as the NexStar and her case. I didn’t do damage to myself, but it wasn’t fun. 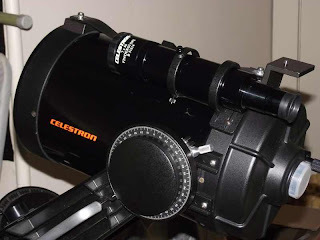 Hate to say it, but the time may be approaching when my Dobsonian needs are better met by one of them new ultralights like Mr. Kriege sells or one of Synta/Orion’s rigs with a rocker box you can break down (and a go-to computer). That’s for the future. On this night I was headed for the hinterlands with Old Betsy and feeling pretty good about it. The sky was not perfect, but it was not bad. Arriving at our little spot of (semi) dark sky heaven, I was pleased to see I’d be in the company of three other observers, a pretty good turnout for the Possum Swamp Astronomical Society on a hazy spring evening. At least I wouldn’t have to suffer the jitters that beset me on my last dark site expedition. The good spirits did not last long, sad to tell. They lasted only till I was preparing to place Betsy’s mirror box in her rocker box. I stopped and set it down on the ground thinking, “Need to connect the cable to the azimuth encoder first,” which was quickly followed by, “What cable?” I didn’t have to go rummaging through the truck to know I’d left the Sky Commander’s encoder cables at home. Was I DOOMED? Was Night 33 over before it began? I briefly considered jumping in the truck and heading back to the old manse for those cotton picking cables. I briefly considered loading the scope back in the truck and calling it a night before sunset. I did neither. I couldn’t face the drive back home and back out again. But I wasn’t in the mood to give up easily. Maybe I’d run the list the old fashioned way. As my faithful readers know, I am not a fan of star hopping. Not anymore. I am focused on seeing, not looking. But I dang sure star hopped long enough—four freaking decades—and I like to think I was good at it. No computer? I’d call up those rusty hopping skills and see how many dim H-2500s they might bring me. I did have a couple of aces up my sleeve. I have replaced my netbook with a full-sized laptop for astro-use. The new machine, a Toshiba Satellite, features a sizeable hard drive, a fast enough processor, good battery life, and, most of all, a 17.3-inch screen. That big display was the drawing card—that and a crazy good price. I figgered my charts ought to big enough on the new astro-puter to make star hopping doable if not exactly a joy. The other ace was my fave computer program, SkyTools 3, which has become the “official” software of The Herschel Project. While I hadn’t used the feature, I knew ST3 was capable of displaying 3-pane finder charts tailored to a specific telescope that show scope, finder, and naked eye fields of view on one screen. Which eyepiece? My NEW eyepiece. Unk hasn’t exactly been filling the coffers of eyepiece merchants in recent years. After buying my 13mm and 8mm Ethoses I’ve been at all-stop. Those two, supplemented by Panoptics and Uwans, have been more than sufficient for my visual work. B-U-T… As I’d begun using Betsy more often I’d started thinking it might be nice to have a 100-degree ocular with a wee bit more focal length than the 13. Something in the 16 – 17mm range. But I wasn’t willing to send Uncle Al 800 big ones for his 17 Ethos. What about the bargain spread? Yes, Virginia, there are relatively low cost 100-degree apparent field eyepieces. They come from China, natch, and are, at last count, sold under three brand names, Zhumell, TMB, and Orion (“Giantview”). These oculars, which are available in 9mm and 16mm focal lengths, are essentially the same eyepieces no matter whose name is on ‘em. Whose do you buy? Whoever’s is cheapest. Orion, my usual go-to guys, wanted $399.00 for their 16mm, which seemed a little high given the reports I’d had on these eyepieces. Specifically, I’d been told by folks whose judgment I trust not to expect edge of field perfection or anything close to it. So, Orion was out. There was TMB, but while the 100-degree eyepieces were still on their website, dealers didn’t seem to have either the 9mm or 16mm in stock. That left the Zhumell folks, a.k.a. 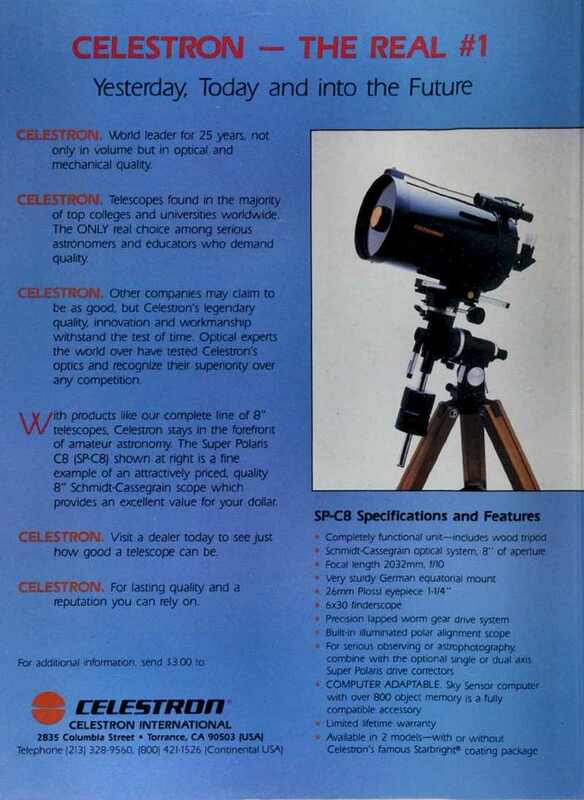 “telescopes.com,” who were selling the 100s for $239.98. While the company and website seem to have a slightly snake-oil redolent reputation, I’ve found their service to be top notch. I really, really like the 100mm binoculars I bought from ‘em last year (I’ll tell you about ‘em some Sunday). 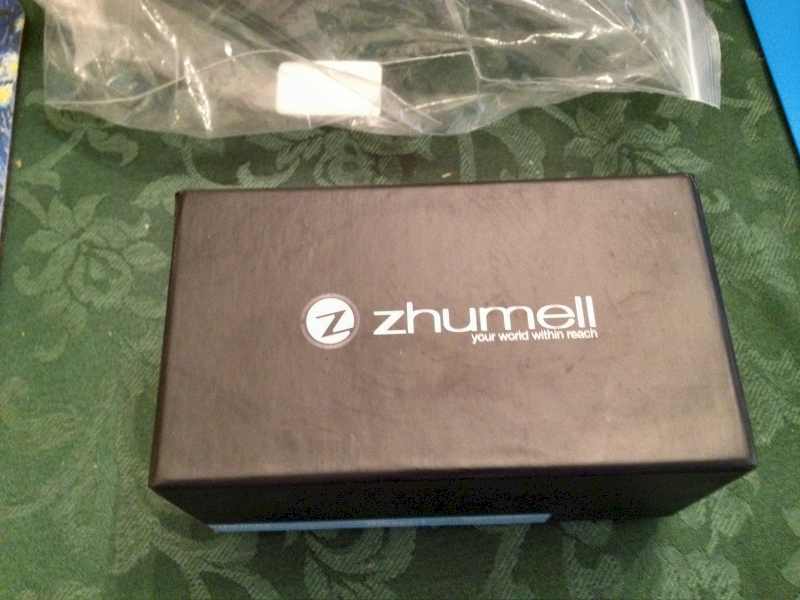 Zhumell it was, then. In fairly short order a smallish package was on Chaos Manor South’s front porch. Opening it revealed the box shown above and not much else. The eyepiece’s container was more or less rattling around in the shipping box. That turned out to be OK. Opening the nice but hardly TeleVue-impressive inner box revealed the eyepiece was well protected by bubble wrap. Under that was a large bolt-style eyepiece case with my prize inside. Initial impressions? The eyepiece is, if anything, less impressive in person than in its pictures. We’ve got used to 100-degree AFOV eyepieces being big honking muthas. This odd hand-grenade shaped thing is relatively small for a 2-inch eyepiece and is amazingly light. But that’s not necessarily bad. 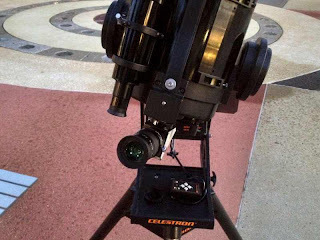 Beer can eyepieces look cool, but big and heavy spells t-r-o-u-b-l-e for Dobsonian owners with balance issues. Otherwise? Nicely executed, I’d say, with even coatings, good barrel blackening on its interior, a fold-down eyecup, and filter threads. Sticking it up to my eye and pointing it at the table lamp in the parlor seemed to indicate there wouldn’t be much trouble with “blackout” despite what some folks had said. 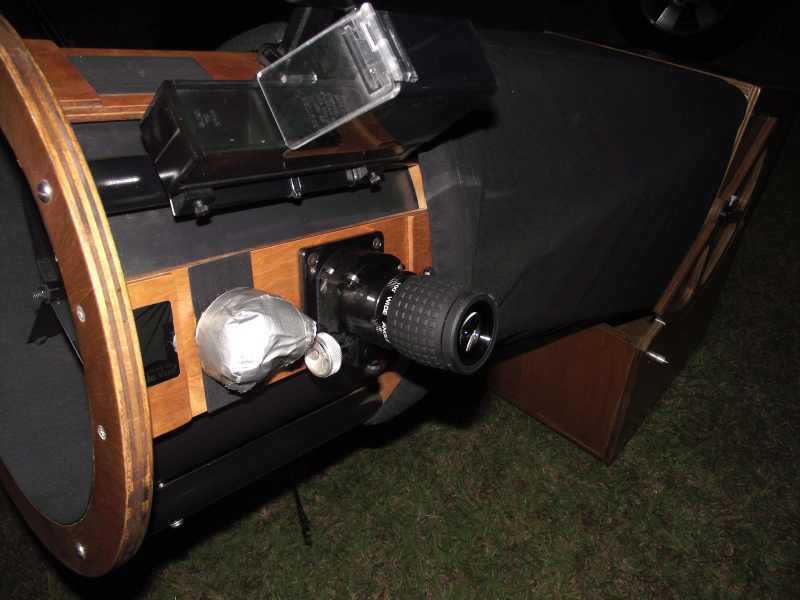 The true test of the 16mm Zhumell could, of course, come only under the stars. Which idea I contented myself with as I stood waiting for darkness to arrive. If I couldn’t run down a single aitch, I’d at least be able to put the eyepiece through its paces. What were my expectations for it? Fairly minimal. The reports I’d heard and read indicated the field edge would be nothing to write home about. Not a huge problem for me. I tend to look at the center of the field, not obsess about the edge, and if the thing was halfway tolerable it would serve its planned purpose as “finding eyepiece,” I reckoned. Putting my eye to the eye lens of the Zhumell revealed the big spring glob making its presence felt in the gloaming. The verdict? The inner 75 – 80% of the field was nice and sharp. At 90% there were comets aplenty. At the field edge those comets had substantial tails. Could I stand the view? You’re darn right I could. The edge was far from perfect, but I still got that expansive feeling only a 100 can give. Yes, stars were ugly at the very edge, but I tended to notice that only when bright stars were there. As I’d expected, blackout was not a factor. One other reported problem, the inability to take in the full field with the rubber eye cup up, was. 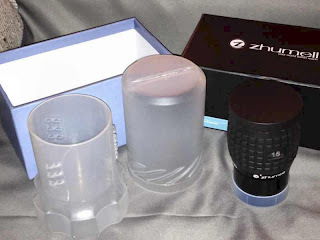 I didn’t find it disturbing to use the Zhumell with the cup down, however, since I don’t like to use ‘em on any eyepiece. Finally, another faux pas I’d heard about, lack of eye relief, was readily apparent. It seemed even shorter than the specified 15mm, but, like the eye cup, didn’t bother me. I never felt my eye had to be overly close to the eye lens. If I had to wear glasses while observing, though, the 16’s eye relief or lack thereof would have been a deal breaker. OK, I could live with a field edge that was about as bad as I’d heard it would be in my f/5 telescope (sans coma corrector; I don’t have a 2-inch one). But how sharp was the eyepiece at the center of its field? Saturn would tell that tale in a right quick hurry. Me and Betsy went there and I was simply blown away. The ringed wonder was dead sharp, with the Cassini Division easy at only 90x, plenty of banding visible, and the beautiful pinpricks of five moons arrayed around the planet. Should you get a 16mm (or 9mm) Zhumell? That depends on you and your requirements. Certainly, going back and forth between the 16mm Z and the TeleVue 13mm Ethos was like the difference between night and day. 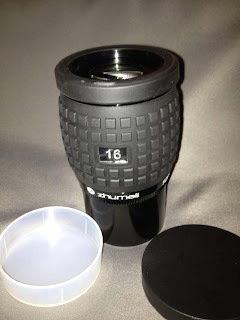 But at 25% the cost of the real deal, the Zhumell is a bargain, and if you, like me, want a longer focal length 100, but don’t think you’ll use it enough to justify TeleVue prices, the answer just might be “yes.” Especially if you use a longer focal length telescope. I suspect this eyepiece will be substantially better in an SCT, and I will let you know about that when I have a chance to try it in one. OK, enough eye candy already; it was time to hit the H-2500. Craning my neck around, I decided Leo was the place to start, since he was the westernmost constellation I still needed to finish out. While I’d visited the lion before in the course of doing the HI and the HII as well as the 2500, he still had a few in the “unobserved” column. I chose a galaxy—Leo’s Herschels are all galaxies—one with a punishing but not too punishing magnitude to start, NGC 3773 (H.III.81) at mag 13.4 down in the area of the lion's rear end about 4.5 degrees west of M65 and M66, and went after it. I didn’t get far. Man, were those star hopping muscles stiff! Afore long, though, I got back in the groove, wending my way down chains of stars to the target. Which wasn’t much to look at; merely an oval fuzzy that required averted vision most of the time. From there, it was "as dim or dimmer" all the way. I began picking 'em off, but was a little disturbed. Small mag 13 galaxies are not normally a challenge for Betsy, even from the compromised skies of our Tanner-Williams dark site. But they were on this night, with a couple giving me absolute fits. I eventually pulled away from the eyepiece after fruitlessly hunting for a sprite that should have been easy. The sky told me why. The haze was thicker than ever and clouds were now increasing in numbers and drifting through the lion. We were getting to the place where Messiers become iffy. I decided to stick it out for a while and see which way the wind might blow. In order to do that, I had to cadge some insect repellent from my buddy Max. The skeeters are definitely back after an exceptionally dry early spring. Normally, my Thermacell would have taken care of them, but I outsmarted myself in that regard. The folks who make Off insect repellent have a competing unit, the “Clip On.” It seemed attractive since its refills are cheaper—the gadget runs on batteries instead of butane cartridges. The inexpensive refills would indeed have been a good thing if the Clip On had worked. It didn’t; it seemed to attract bugs rather than repel them. I was being bitten like crazy even with the piece of junk clipped to my belt. Back to the Thermacell for Unk. The sky improved slightly around 11 p.m., not enough to allow me to get back to the 13th magnitude crowd, but enough to essay some purties. The Zhumell 16mm paid for itself with its view of the Leo Trio. M65, M66, and NGC 3628 were scrumptious. All three were detailed and all three fit in the same field. Yowza! Same thing with M81 and M82. How putrid was the sky getting? 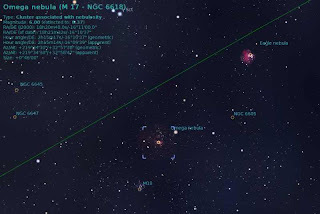 I went to the M105 galaxy group for a look-see. Normally all three galaxies are easy, with NGC 3389, the only even marginally tough member, being visible from the uber light-polluted backyard of Chaos Manor South with a 12-inch. When I hopped to the little triangle of galaxies, 3389 was only “suspected.” Which meant it was Big Switch time or near-about. A visit to M13, a look in on M51, and one more delicious gaze at Saturn and it was time to throw that accursed switch. 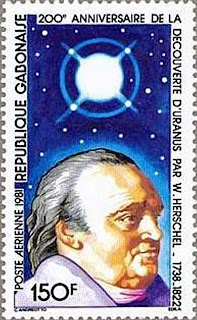 I was soon back within the nurturing walls of Chaos Manor South watching yet another installment of those incredibly silly Ghost Adventures (“STOP RUNNING!”) and meditating on Herschel Night 33. Was I still mad at myself for forgetting the Sky Commander cables? A little, but not as much as I would have been if it had been a clear night perfect for aitch-chasing. I suppose I was lucky to get any new ones at all given the conditions, even if “new ones” amounted to a measly five galaxies. But I had fun, and for me that is still what amateur astronomy is all about, muchachos. Uncle Rod News: It ain't like Uncle Rod never toots his own horn (ha! ), but I do try to keep that sort of thing to a minimum in this here blog. Nevertheless, I can't resist letting y'all know that with the July issue I become a Contributing Editor at Sky and Telescope, a high honor, that's for dang sure. Somewhere way up the time stream ten-year-old Unk is sitting awe-struck devouring his first issue of The Magazine. In my very wildest fantasies I could imagine my name appearing in Sky and 'Scope (as the Old Man called it), maybe in the "Amateur Astronomers" column, but certainly not on that storied masthead! There are some deep sky objects we hold dear from the beginning, muchachos. Most of us looked at the M42s and M13s early on, kept coming back to them, keep coming back to them, and have known them like the backs of our hands for our whole amateur astronomy careers. Then there are the ones that grow on us. With me that’s M8, M101, and M17, the Swan (a.k.a. Omega) Nebula. My first look at M17 was from Mama and Daddy’s backyard the summer of my Palomar Junior 4.25-inch Newtonian reflector. The nebula is remarkably bright, certainly, at magnitude 6. 0 or so, but it didn’t impress me. It was low down in the south, and trees and the lights of the main body of our subdivision made it not much better, if any better, than the even lower Lagoon Nebula, which I didn't like much as a sprout either. All my 1960s logbooks are gone—with the exception of one single page, my drawing of Copernicus—so, alas, I can’t give you my first impressions of The Swan verbatim. I do seem to recall it didn’t look a dern thing look like a swan or an omega no matter what the books said or how I held my mouth as I squinted into my Kellner eyepiece. All I was seeing in my Pal was the Swan’s body, which was nothing more than a short “dash” of dim light, a barely visible streak in the 1-inch (25mm) Kellner. I’d expected a little more for my effort, since I’d found the nebula kinda trying to track down among the subdued stars near Scutum, but, well, it was what it was, and it wasn’t the only deep sky object, I was sadly realizing, that didn’t look as good in the eyepiece of my 4-inch as in the pictures from Mount Palomar. 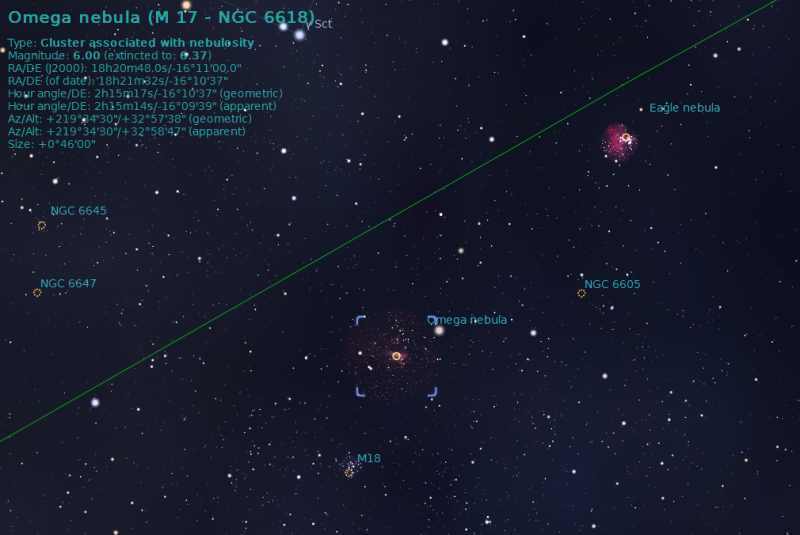 M17 is situated in the deep summer constellation, Sagittarius, which makes it a little low for observers at mid-northern latitudes, but at least it’s in the more northerly part of The Archer, almost over the border and into Scutum, the little constellation near the tail of Aquila the eagle. How far away? Like most nebulae, the distance to M17 isn’t well known, but it is thought to be about 5,000 – 6,000 light-years from our pebble in the sky. Like the Orion Nebula and the nearby (and far more subtle) Eagle Nebula, M17 is a place of star birth, and the swan shape is just the brightest section of a huge complex of nebulosity. Being a Messier, it shouldn’t surprise anybody that M17 is considered a “showpiece” object, whatever the hell that means. 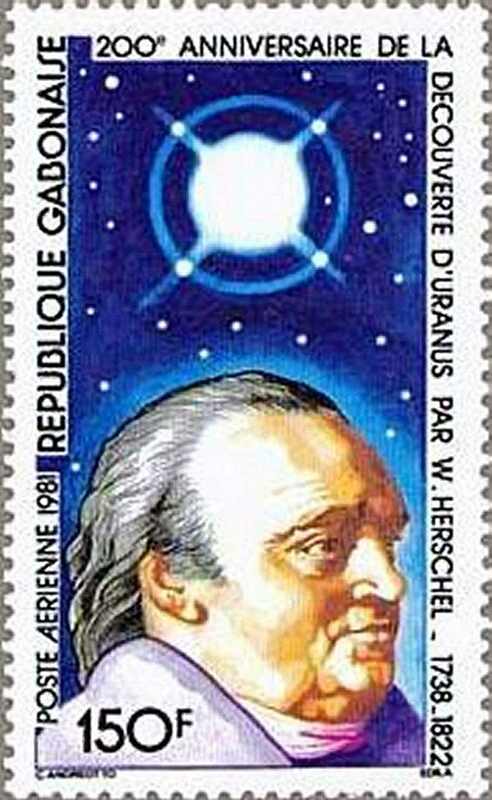 It is easy in surprisingly small telescopes—it is a treat in my Short Tube 80 under dark skies. It responds well to a UHC nebula filter, and the more aperture you can pour on, the more you will see. It is detail rich, being crisscrossed by dark lanes and spots. As above, it is just the brightest part of a huge cloud of nebulosity that in the deepest images looks more like a football than a swan or omega. 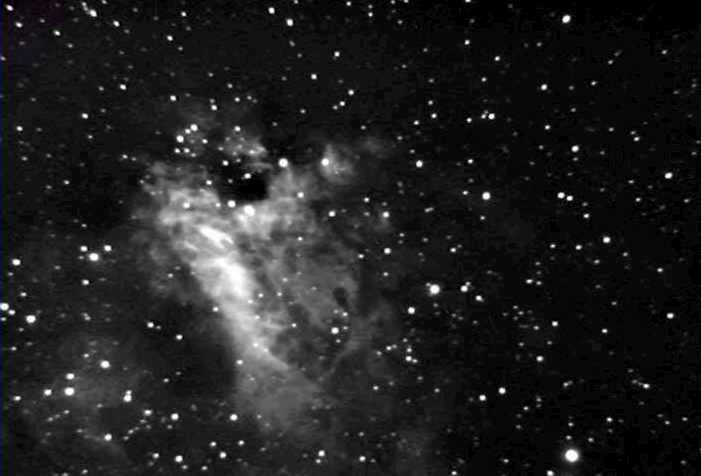 It was nice to capture another Messier, but I didn’t linger; I just checked M17 off on my list and moved on. Like a lot of novices who’ve just found their deep sky feet, I was more interested in hunting than I was in looking. Unless an object was truly spectacular in the M13/M42 mold, I might give “the new one” a minute’s examination before I was on to something else. Did I revisit M17 during my Arkansas sojourn, the years when I was stationed at Little Rock Air Force Base? I must have, but I don’t remember it. No doubt M17 would have looked far better from the rural Arkansas skies of the 1970s than it had from The Swamp, and my 8-inch Cave or the Orange Tube C8 that followed it would have brought the Swan’s neck into stark view. But at the time I was more interested in tackling Virgo-Coma’s galaxies and getting going with deep sky astrophotography than I was in looking at dumb old Messiers again. The next time I paid Miss Swan the attention she so richly deserves? After I moved back to The Swamp in the early 1980s and thought up another one of my (sometimes slightly wacky) observing projects. I’d do the Messier, all the Messier, including M101, M74, and the rest of the list’s birds of ill omen from my light polluted backyard whose skies were every bit as sodium-streetlight-orange as Chaos Manor South’s are today. The amazing thing is that my backyard quest for the Messiers turned out not to be as ridiculous as it sounds. By waiting till Ms culminated, and waiting for “special nights”, I got them all fairly quickly. How did my observation of The Swan compare to what I’d seen from Mama and Daddy’s considerably better backyard? It was better, but not that much better. I had a larger scope and more experience, way more experience, under my belt, but like most nebulae, especially southern nebulae, M17 cries out for dark sites. It was pretty enough, and since I had a better idea how to attack faint stuff, I thought I could see the neck on good nights. But usually M17 was just that same old boring streak of nebulosity. 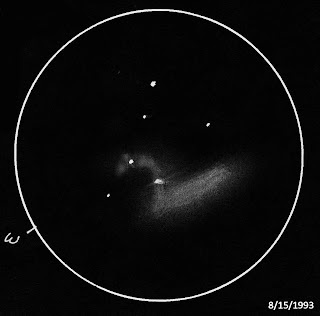 After my backyard Messier survey, whose observations went on to form the heart of my book, The Urban Astronomers Guide, I didn’t get back to The Swan for a few years, not till I began observing from the Possum Swamp Astronomical Society’s old Hurley, Mississippi dark site. At the time, the PSAS was blessed to be under the leadership of one of those rare amateurs who can almost magically transform a sleepy little astronomy club. Whose excitement for the night sky is, yes, infectious. David wasn’t just on the cutting edge gear-wise—he bought an LX200 (Classic) the minute they became available—he almost singlehandedly put together a pretty good club newsletter, writing and printing it on, shazam, one of them new-fangled IBM compatible computers. And he undertook the usually thankless job of Club President. Yep, David was a go-getter, and the first thing he set out to get was a new dark site for us. Clubs tend to wither away if there is no group observing under an at least half-way decent sky, and he was not about to let that happen to the PSAS, who’d been without a good observing location for a while. David made friends with a young farmer who had an unused patch of a field in the tiny community of Hurley. The field was perfect for us, fairly secure, fairly dark, and only about 45-minutes from town. But it was not perfect. It was situated right next to a big pond, and all spring and summer played host to legions of vampire-class skeeters. The fire ants sometimes got out of control, too, building enough mounds to make the observing field a mine field. 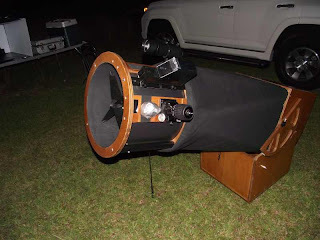 As a matter of fact, a PSAS member who liked to use his telescope while he was moderately to heavily tipsy ran afoul of the fire ants and suffered some damage to himself and to his pretty TeleVue Genesis refractor one night. He punctured a nest with a tripod leg, causing his scope to tip over and the ants to attack him with their accustomed ferocity. It was hard not to laugh at Gomer doing the chicken dance across the field trying to shake off the critters, but I stifled myself. Fire ants can be serious business, and have put more than one person in the hospital—or worse. As y’all know, it is not unknown for me to get spooked at a dark site when I am there all by my lonesome. That was just as true in the Hurley days as it is now. If anything, that site was more lonely and isolated than the current PSAS observing field. There was also a real cause for concern, since this was at the dawning of the meth trade, whose explosion left some formerly peaceful country spots more dangerous than inner-city slums. I could usually depend on one other person being on the site with me, but not always. President David had a pretty rigorous work schedule, and the club was in transition, with a couple of our most enthusiastic observers having moved away. I had two things going for me on the evening I went Swan hunting. One was my Walther PPK—not that I ever needed it for anything other than emotional reassurance. The other was that it had been several years since I’d been able to observe from a dark site and was not about to be robbed of the deep sky delights by a cotton picking case of the nerves. To be honest, though, I was relieved rather than put out to be blinded by the approaching headlights of the cars of a couple of PSAS members just after dark. The area to the northwest of Possum Swamp can still offer some good views, but our Hurley site to the southwest has been compromised by the construction of a huge truck stop on I-10 just south of the dark site. The final nail in the coffin was the coming of the Mississippi Gulf Coast casinos with their neon signs and their laser light shows. But in the early 90s the heavens were still surprisingly dark and deep. Which was attested to by me mistaking the summer Milky Way for incoming clouds on this night. 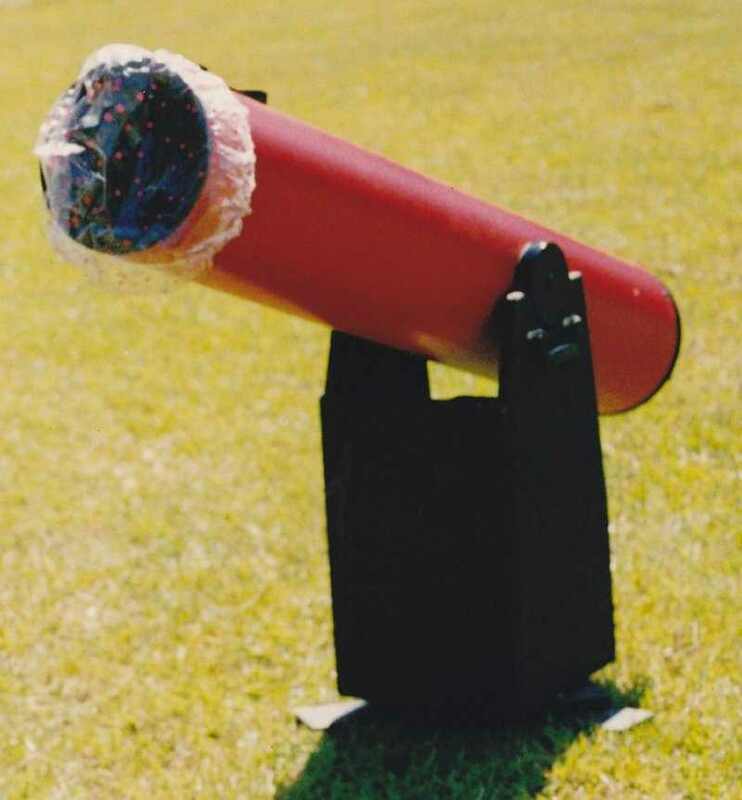 The Telrad, an Orion/Vixen 25mm Kellner, and Sky Atlas 2000 eventually got my brand new Coulter 8-inch on the field of M17, but it seemed just about as hard as when I’d been a kid. The Swan was one of the objects I found more difficult to find than I thought it should have been. There are certainly plenty of stars visible in its area of Sagittarius to hop to The Swan from, but that never helped. I’d always be saying bad words well before I found the nebula. Winter’s M37 is another “easy” one that would get me to spouting fire and brimstone in the pre go-to days. Don’t ask me why. Back when my ‘hopping skills were at their peak, I thought nothing of tracking down the dimmest sprites of NGC galaxies, but M17 and M37? Katy bar the door! When I finally found The Swan, the first thing I focused on was the “neck,” which had eluded me as a sprout. This curving arc of nebulosity, which is also the omega if you see a Greek letter here, was unmistakable. Both it and the “body,” that dash of nebulosity leading away from it, were visibly crossed by dark lanes, just like in the pictures. I looked and looked, hoping to catch some of the outlying clouds that litter the area. No dice. That would have to wait for darker skies and maybe more aperture, I reckoned. My logbooks from the 60s and 70s are gone, but I still have those from the 80s and 90s. My impression of the Swan on that hot August night in 1993? Despite relatively poor skies (scattered clouds/haze), M17, The Swan Nebula, is bright. The neck is easy to see and the nebula shows dark details, including a lane that cuts the "body" in half. This was first light for the Coulter Odyssey 8-inch f/7, and it performed well and got quite a few favorable comments regarding its optics. But aperture is sometimes only part of the equation. Given the DSRSG’s mid-fall date, M17 was darned low by the time it was dark. Even 12-inches should have been hampered. It was not. The neck and body were just like they’d been on that good night in Hurley, only moreso. The Swan wasn’t just brighter, more dark lanes and patches all along neck and body swam into view. The body of the bird actually began to look more like a fish, with a V-shaped "tail." Mer-swan? The frosting on the cake was that holy grail of Swan watchers, the “external” nebulae, the patches of nebulosity away from the main body. An elongated spot just above the Swan’s head was particularly easy to see. And that was it for the old crow for a while. Till I decided I’d try CCD imaging again. For the second time. The first time had been something of a disaster. I got absolutely nowhere; the resulting CCD images I got after a lot of blood, sweat, and tears were decidedly worse than my 1990s vintage film astrophotos. 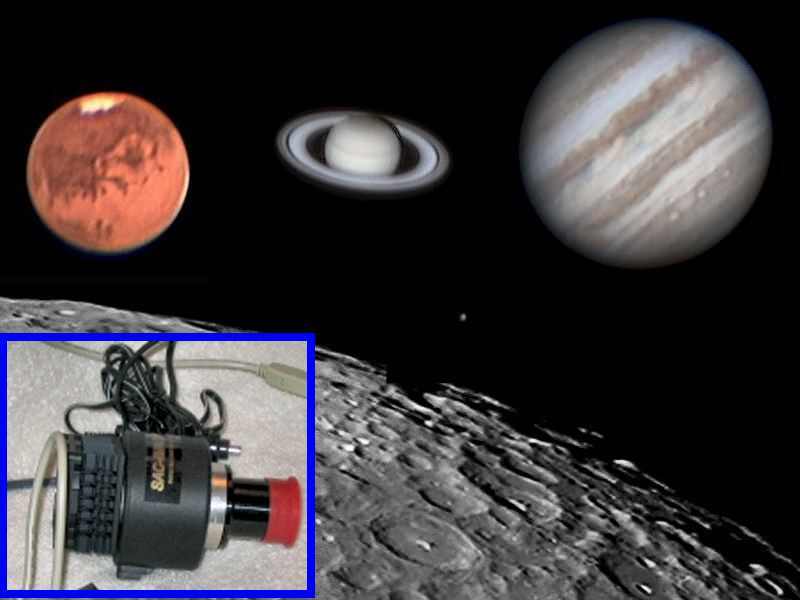 The reasons for that were several, but mainly it was that a dozen years ago affordable CCD cameras, those that hovered around the one-grand level, had very small imaging chips. “Web-cam size” we’d call ‘em today. That made it incredibly difficult to get targets in the field, since I was using Celeste, my Ultima C8, on her original fork. She had no go-to and no digital setting circles. If I’d a-had good sense, I’d have bought a set of DSCs before the camera. But I was so excited about the “CCD revolution” that all my mates were talking about and joining that I couldn’t restrain myself. I bought a Starlight Xpress MX5, and had at it. How hard could it be? The MX5 was really not a bad camera for the day, it just wasn’t much fun to use. I’d spend hours in the backyard the summer I got it, come in hot and frustrated and snapping at everybody, and usually wouldn’t have much to show for it. Even though it wasn’t great shakes on the deep sky, the MX5 was capable of taking pretty good planetary images, and if it had only had color I’d have kept it for that reason. It didn’t, so just before the big Mars opposition of 2003 it went on Astromart and I bought a SAC 7b. The story of the SAC camera, made by a tiny outfit down in Florida, is one I ought to tell y’all some time, but suffice to say it was a modified color webcam with a Peltier cooler and could take outstanding images of the Moon and planets. Deep sky? Its chip was even smaller than that of the MX5, though I did get recognizable shots of M57 and M13. I contented myself with imaging The Angry Red Planet, Jupiter, Saturn and the Moon with the SAC 7, but once Mars had sailed away, I felt the call of the Great Out There again. Not that I was planning to buy another CCD camera. Till I got a call from my old pals at Anacortes Telescope and Wild Bird. 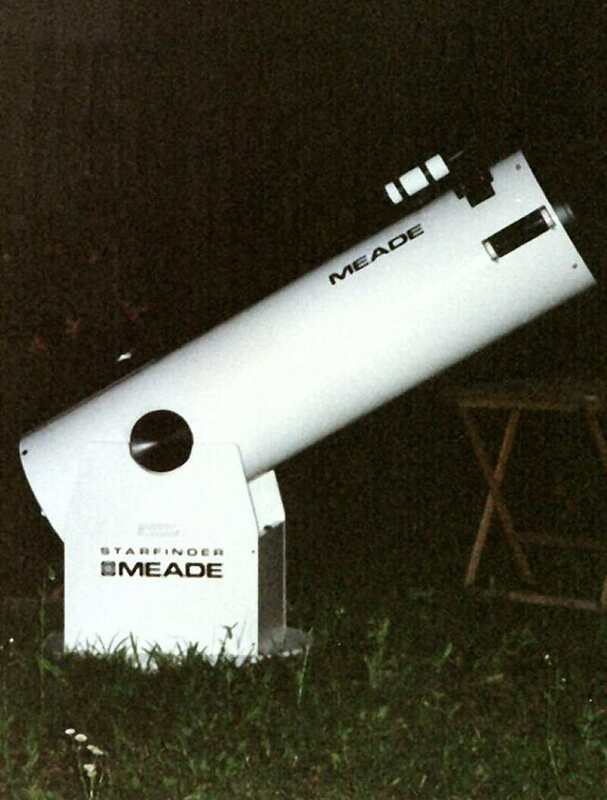 Seems as they’d just got a shipment of the new Meade DSI CCD cameras. The DSIs were in short supply, and they were holding one for me. Wouldn’t I like to send them my credit card number? Was that true? Meade has been known to use a little hyperbole in their ads, but for once it was. Yes, the software was kinda complicated. It did EVERYTHING except cook your supper, helping frame and focus and guide and process. It took me a night or three to figure out how the hell to work it; that’s for sure. But when I did, I finally began getting the CCD pictures I’d dreamed of. They were at least as good as the best of my film astrophotos and they dern sure were easier to get. Not only was the DSI more sensitive than the MX5, I was able to stop worrying about drift polar alignments and guiding. By now I had my Celestron CG5 GEM, which had a built in polar-align routine. If I used that, I could take 30-second – 1-minute exposures with the C8 at about f/4 without guiding. Even better? The DSI would automatically stack my short subframes into a finished image—on the fly. That was what Meade’s somewhat confusingly written manual said, anyway. I doubted the dang thing could possibly work like they said, but I intended to find out. One early summer night I dragged the Toshiba laptop, the CG5, the C8, and the DSI out to the in-town observing site which was all the PSAS had in the mid-oughts. Our once enthusiastic President Dave had burned himself out like a meteor in the mid 1990s, stepped down from his office, and soon dropped out of the club and amateur astronomy altogether. Since none of us were acquainted with the farmer who owned the land in Hurley, we felt funny about continuing to use the site. Especially after we went one rainy summer without getting out there even once. Instead, we began observing from the same place we held out meetings, the public schools’ Environmental Studies Center. It had started life twenty years before in the midst of reasonably dark suburbs, but eventually even slow growing Possum Swamp had expanded enough to make its skies badly light polluted. But wasn’t that part of the supposed CCD allure? That you could get reasonable deep sky images from putrid skies? We’d see. Hokay. Set up the CG5, aligned it, did the polar alignment procedure with the hand control. Removed the eyepiece and diagonal, screwed on the Meade f/3.3 focal reducer and mounted the DSI. Next step was picking a target. Why M17? I figured it would damn sure show what my 300 buck CCD camera could do. While reasonably well placed in a somewhat darker part of the ESC sky, The Swan was low and it was hazy over thataway. After a little twitching of the focus control, the stars around the nebula, which was weakly visible with a few seconds of exposure, were good and sharp. I did a Preview 30-second test, adjusted the image histogram, and told the computer to take 30-second exposures till I told it to stop and to stack those that were of good quality. I clicked on a bright star to serve as the software’s alignment reference and let ‘er rip. While the DSI did its thing I tried not to worry about the picture “developing” on my laptop’s screen, stealing worried peeks at the computer every once in a while. What I was seeing actually seemed to look pretty good. When we were done? The Swan would certainly need some processing with Adobe Photoshop—or with the antique but fairly effective image processing program that shipped with the DSI. But, not bad, not bad at all. The color image above was the result, and the fact that I can still stand to look at it today says that—given my humble requirements—it is indeed OK. If there is a single fault to it, it is that it is overprocessed. I was just learning the difficult art of image processing, and tended to do too much rather than too little. Back then? I was as happy as a schoolboy, I was as giddy as a drunken man. 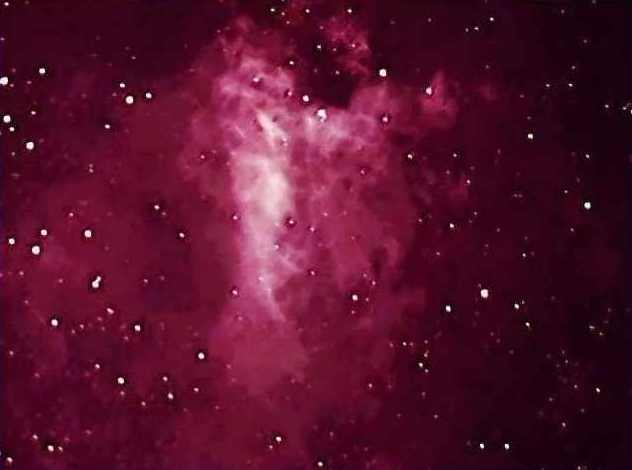 Not only was the swan shape as clear as day and as red as a glass of Chianti, I could finally “see” all that elusive nebulosity with my own telescope! I’ve since gone on to take video images of M17 like the black and white one here with even greater ease, and I’ve done “stills” with my DSLR and ST2000 CCD camera that far exceed the quality of that first humble M17 snapshot. But maybe I still love that DSI shot best—it was the CCD breakthrough I’d needed. I’ve gone on to get better visual looks at M17, too. Since the 12-inch Dob is still my BIG GUN, though, that’s required better eyepieces and, most of all, light pollution reduction filters, UHCs and OIIIs. Come to think of it, maybe it is finally time we talk about LPR filters muchachos. Why don’t we do that Sunday after next? It began one sunny afternoon (must have been). I had just put the finishing touches on the copy—the text—for my second SCT book. I was almost done with Choosing and Using a New CAT. All I needed was a few more pictures, terrestrial type pictures. I had sworn that, unlike my original CAT book, this one would not want for photos. One thing I wanted to illustrate was the removal of a Schmidt Cassegrain’s corrector plate. It would not be a big deal to pull Celeste’s or my number two C8’s corrector, taking pictures as I went. But I wanted to go further. 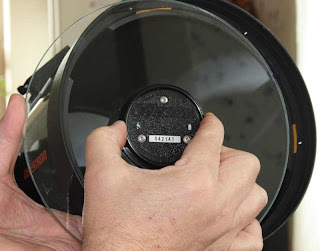 I wanted to show the removal of a C8’s primary mirror and other potentially dicey things. I wasn’t askeered, but doing that to either of my beloved C8s did make me just a mite nervous in the service. What if I glommed onto another C8? It wouldn’t have to be pristine. It wouldn’t have to work right. It wouldn’t have to work at all. All it would need would be a corrector plate and a primary mirror for me to remove. I started searching the usual venues—Astromart and Cloudy Nights—for unloved C8 tubes. With little success. There were plenty of scopes of various ages and conditions for sale, but I did not run across one in poor enough shape that it would go for the 100 – 150 bucks or less I had in mind. I didn’t give up hope. I put out the call on my SCT User Yahoogroup. 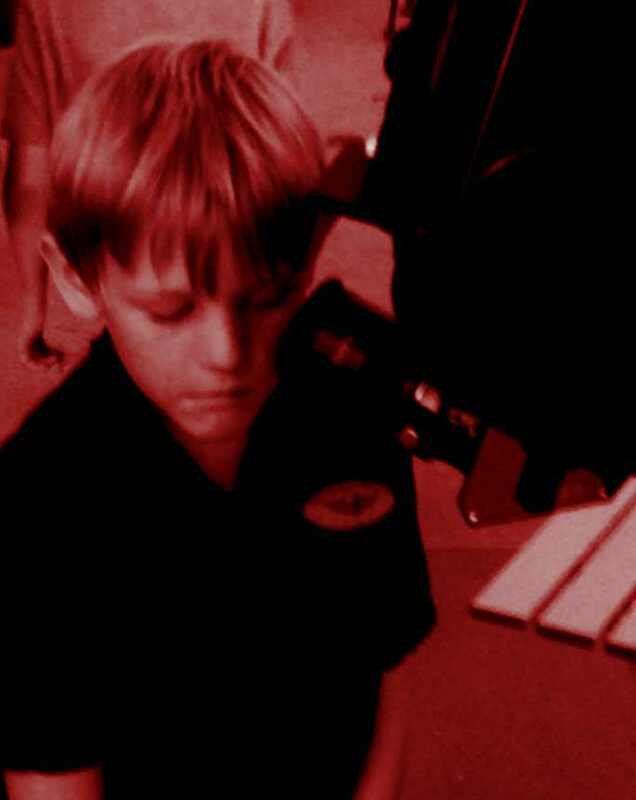 This e-mailing list, which I started in 1999 (and whose beginnings might be the subject of a blog some Sunday), is inhabited by the most knowledgeable Schmidt Cassegrain enthusiasts in the world. If I’ve learned anything about my favorite variety of telescope beyond the bare essentials over the last thirteen years, they are responsible. They are also some of the nicest amateurs around, and since, as I always say, amateur astronomers are the nicest folks anywhere, that is something. It wasn’t long before I had a reply. One thoughtful individual had a hangar queen of a C8 he wasn’t using, needed fixing, and that he wouldn’t use even if it was fixed. He was more than willing to volunteer this scope for the cause. Naturally I jumped at the offer, insisting (I had to insist) on paying the freight. When the package arrived, I tore into it and had a look. 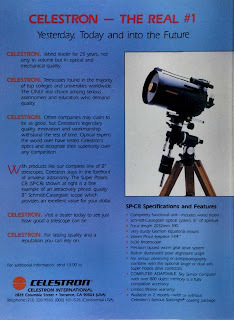 What I had before me was a black tube Celestron 8 OTA whose serial number seemed to indicate it was manufactured in 1984. Maybe. Celestron serial numbers have always been purty wacky. Just when you think you have cracked their strange code (which changed a time or three), you find a telescope that doesn’t fit the pattern. Serial number aside, the “ribbed” rear cell indicated this wasn’t no spring chicken. Another tip-off to the C8’s vintage was the weird stuff on the top of the tube. There was a camera piggyback bracket on the rear cell and a corresponding aluminum block on the corrector assembly. 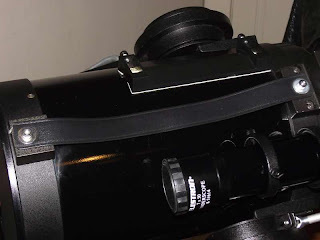 The piggyback bracket in the rear and the block in the front were connected by a plastic (reinforced with fabric threads) strap, which I recalled was intended to be used as a carrying handle, a handle to help you mount the scope on and remove it from its Vixen Super Polaris GEM mount. Yep, this was an old SP-C8 OTA. While the Super Polaris C8 did go on sale in 1984, the earliest ad I could find showing an SP-C8 OTA with the handle was from 1988. I seemed to remember the piggyback/handle OTAs as coming a little later than 1984, so 1988 or maybe 1987 seemed a distinct possibility. Which put the scope’s year of manufacture squarely during the visit of Halley’s Comet, a time when both Meade’s and Celestron’s quality suffered. Well, I hadn’t planned to do much with this scope other than take it apart. If I decided to try to observe with it? Some Halley scopes are bad, but some are pretty good. OK, what gave it its hangar queen status? It was missing its 30mm finder, which must have gone to serve a scope in better health. It did have a pretty plastic (non-locking) corrector cover, which, naturally, fell off the instant I removed the scope from the box. The OTA was missing the plastic cap for the rear port. What else? While examining the C8, as I always do in these cases, I gave the secondary mirror mount a twist. It spun freely. Ah-hah! That was the principal faux pas of this ancient feline. The rear cell port cover problem was solved with just a minute or two of rummaging through one of Chaos Manor South’s many telescope junk drawers. The rotating secondary assembly? That was a different matter. Might be easy to fix, or it might require some cogitation, if not blood, sweat, and tears. A little strategizing might be required, but an SCT’s secondary is at heart a simple thing. The plastic secondary assembly (the secondary mounts of some early scopes are metal) of a Celestron (or Meade) scope is inserted through a hole in the corrector plate. The outer face of the assembly with the collimation screws on it is held in place against the lens by its slightly larger diameter. The secondary mirror extends into the interior of the OTA, natch, with the secondary facing the primary. A slightly conical baffle is attached to the secondary assembly on the inside. This performs two functions; it reduces stray light and it secures the whole secondary assembly firmly in the corrector. On Meades, the baffle is threaded and screws onto the secondary assembly, which is also threaded. If the secondary mount on a Meade scope comes loose, fixing it is just a matter of removing the corrector and tightening-up the baffle. If only it were that simple with a Celestron. Usually it ain’t. On all the Celestrons I’ve disassembled, the baffle has been glued to the secondary assembly, not threaded in place. Sometimes, it’s fairly easy to break the glue loose. Would that be the case with this one? No point in wondering, might as well find out. I pulled the corrector, being careful to note the position of the little paper centering shims around its periphery. Twisting the baffle while holding the other part of the assembly tightly had zero effect. Obviously glued down real good, dammit. What to do? I’ve helped quite a few folks solve this conundrum. Sometimes it is as simple as bearing down a bit. Just be sure to bear down somewhere where the corrector will land on a padded surface if it gets away from you. No dice. No matter how hard I twisted, the baffle was not coming loose. Not even with the aid of a pair of strap wrenches. I felt like if I applied any more torque something was a-gonna break. OK, idea two. I’ve sometimes had success in breaking the glue loose by the application of alcohol with a Q-tip. No matter how much I used, or how long I gave it to soak, nothing changed. Still stuck. I’ve occasionally been tempted to try some WD-40, but the prospect of cleaning it up, and maybe damaging plastic has always restrained me. Hokay, lets go nuclear. For the most afflicted patients, what I’ve done is subject the secondary to several freezing-warming cycles. I put corrector and secondary in the freezer for 15-minutes and gave it another try with the wrenches. Nope. Repeated that several times, and, finally, the dang thing budged. Shortly I was holding the two halves of the secondary assembly. Some amateurs wonder if this freezing-warming might break or crack the corrector, but that has never happened to me and I’ve not heard of it happening to anybody else. Anyhoo, with the secondary apart I could set about repairing the rotation problem. Before I did that, I checked the surface of the mirror. It looked OK. If it had not been? I generally counsel against cleaning SCT mirrors, but if the secondary mirror in this old puppy—err… “kitty”—had been dirty I might have had a go at it with distilled water. It didn’t need it and neither did the primary, which, in typical SCT fashion, still looked surprisingly good after all those years. The corrector did need cleaning, and I did that in my usual way with blue Windex, white (no lotion) Kleenex, and canned air. Now for the fix. Since this Celestron secondary mount/baffle was glued together, it would, alas, require more glue to put it back together. The glue I chose for Agnes Gooch (which is what the C8 whispered her name was) was good, old Superglue. It holds firmly, but in my experience is also sufficiently easy to break loose from plastic should you need to later. I know it’s probably not the best adhesive for plastic, but it doesn’t seem to do bad things to whatever sort of plastic Celestron uses. Before I glued it down, I’d need to get the secondary’s rotational orientation correct, which is very important with both Celestrons and Meades, and which was easy to do with this scope. The brackets on the OTA’s top were a good indication of “up,” and all I had to do was rotate the secondary mount till its serial number was right-side up and correctly oriented relative to them. The rotational position of the corrector is indicated by a tiny engraved serial number, which goes at 3 o'clock (and which also indicates you've got the correct side of the corrector facing out if you can read the numbers correctly while facing it). Glue time. I won’t say I did the neatest job in the world, but I did OK, and after the Superglue had set for 24-hours the secondary was firmly locked in place. OK, Agnes was off the operating table. What now? Collimation. But to collimate, I’d have to mount her on, well, a mount. Should I order a Vixen format dovetail and put her on the CG5? That would work…but…then I’d have three C8s for the CG5. What if…what if… I put Agnes on the Ultima 8’s old fork? Two birds with one stone. That would provide a heavy-duty (emphasis on HEAVY) mounting for the OTA, and it would help me stop feeling bad about letting that wonderful ultima mount gather dust upstairs in Chaos Manor South’s Massive Equipment Vault. Naturally, I had retained the screws that had attached Celeste to her fork. Hell, I even knew where they were. It was the work of just ten minutes to get the tube on the fork. In retrospect, I should have taken my time. I should have hunted down the long hex wrench needed to spread the fork’s arms apart. I skipped that step, which resulted in me putting a right good scratch on the tube in the process of getting it mounted. A little black automotive touch-up paint fixed that later. Hokay, tube on fork. What did I think of Miss Agnes, the faux Ultima 8, the FRANKENSCOPE reanimated with dead SCT body parts? I missed the rear cell handle on my real U8 OTA, but balance seemed fine, and despite the wacky handle, the combo looked pretty good. Since, amazingly enough, it was clear that evening, into the backyard for a collimation run with Polaris we went. Although I use Bob’s Knobs, which I love and swear by, on Celeste, I must admit Agnes’ Allen collimation screws are a close second and far more pleasant than the Phillips screws on newer Celestrons. I dialed-in Agnes without a hitch, and from what I could tell from a quick star test in skies that were growing increasingly unsettled, her optics were at least OK. Before I could learn more or look at anything else, a great river of clouds poured in just slightly behind schedule. After that? Nothing. Nothing for over three years. I did the photo shoot for Choosing and Using a New CAT, even pulling Agnes’ primary (those pictures wound up on the cutting room floor, I’m afraid), she was put back together, the book was published, and Frankenscope went upstairs to sit. Why? Celeste on her CG5 and the fork mount NexStar 11 GPS worked so well I didn’t see why I’d want to lug out a dumb old manual SCT. Should I sell her? Give her away? I considered the options, but never got around to deciding whether she should stay or go. 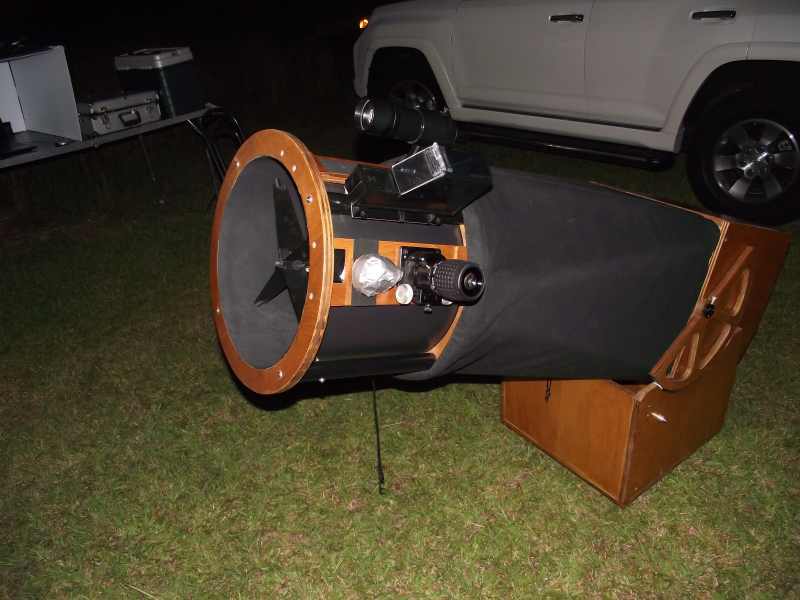 OK, then how about the RV-6 Dynascope Newtonian who has been my nominal public-outreach scope for a while? Exquisite optics in the long focal length 60s Newtonian mode. I use her for a variety of public outreach activities, including with my college students and public school pupils. The only problem? 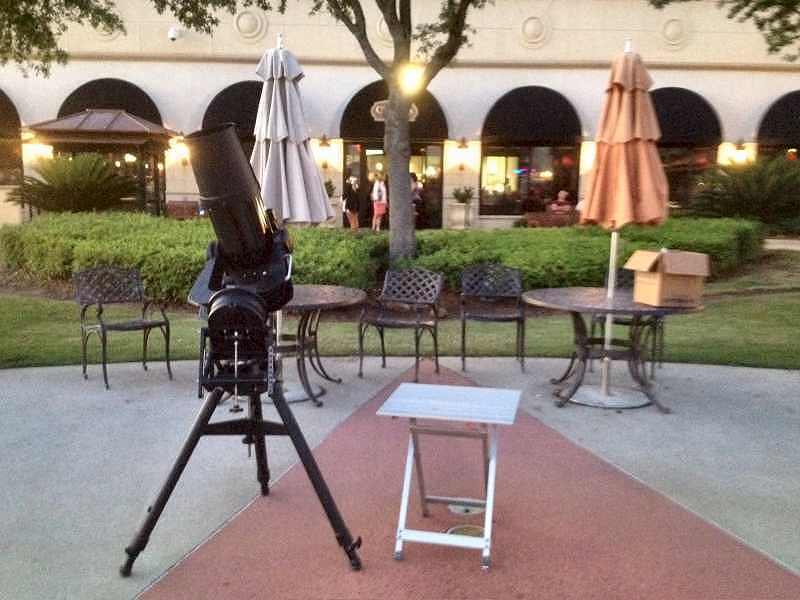 For a venue like the one we’d be at for Astronomy Day, a big outdoor shopping mall? Many of our observers would no doubt be the littlest of little folk, and it is impossible for them to get at the eyepiece of a long Newtonian. Yeah, I know there are dodges. You can bring along a step-stool. But I worry about the wee ones taking a nosedive off one or somebody tripping over one, even in the (at best) semi-darkness of the shopping center. The tiniest observers have to be held up to the eyepiece by their parents (don’t you lift ‘em up; in this day and age leave that to parents), and most of ‘em don’t see a blessed thing. Agnes Gooch it would be, then. I’d need to check her out to make sure she was ready to go, of course, which I did that very night. First up was a little cleaning to get rid of several years’ accumulation of dust and dirt. After an application of Pledge to her OTA, Missy was looking right fine. It was then that I remembered I’d forgot to remove the nine-volt battery that powers her drive when I’d stored her upstairs. Hoped it hadn’t leaked. It hadn’t. I trashed it and installed a new bunny battery. Flipped the switch from o-f-f to o-n, and the correct light came on. Hunted up the HC, plugged it in, and the drive responded to east and west button mashes as it was supposed to. 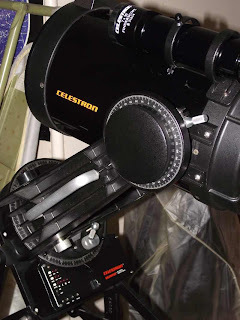 I could tell by engaging the little-known faster slewing speed some of Celestron’s older scopes feature: hold down E or W and press the opposite button and the drive will ramp-up in speed. I let the scope track for a half hour or so to make sure all was well—it seemed to be. All that was left was installing a finder. That could be just a Telrad. I had forgotten I’d done so, but at some point I’d bought a Telrad base and applied it to Agnes. Maybe for the photo shoot. A Telrad would be OK…but…what about Celeste’s original Celestron finder scope, a lovely Japanese 7x50 illuminated job? Celeste now sports an Orion RACI right-angle finder, so the original finder scope and rings were sitting unused. In ten minutes, they were on Agnes and she looked prettier than ever. Miss Dorothy was impressed. Astronomy Day finally arrived, and that afternoon it was time to round up Agnes’ pieces and parts. Diagonal? 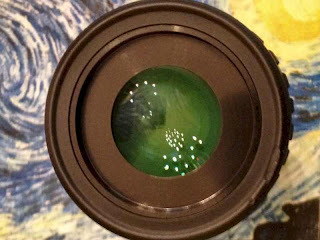 I wanted to use a 30mm wide field eyepiece, an 82-degree apparent field 2-incher, a “Birdseye,” which Herb York used to sell at Anacortes, so I’d need the 2-inch William Optics Diagonal. Other eyepieces? I figgered I’d bring the Orion Expanses. Nice, wide fields and large eye lenses that are easy for younguns to look into. Why don’t I use my Ethoses at public outreach events and give the kids the best experience possible? Well, I’ve waffled back and forth on that over the years, but in addition to not wanting to scrape teen mascara and lollipop residue off my TeleVues, I find that in an f/10 scope the Expanses deliver wonderful views. Mom and Pop and Bud and Sis ain’t gonna know the difference, anyways. At 6 p.m. it was time to load up the 4-Runner and make tracks for the shopping center just across the bay in the little town of Daphne. Loading was not bad. Yeah, I now recalled just how heavy the combination of Celestron’s original rubber coated field tripod and heavy duty wedge was, but it was not too painful. And the fact that I didn’t need to lug a jumpstart battery and the pair of counterweights the CG5 requires meant loading went fast: scope/fork, tripod/wedge, little camp table, eyepiece box, and I was done. 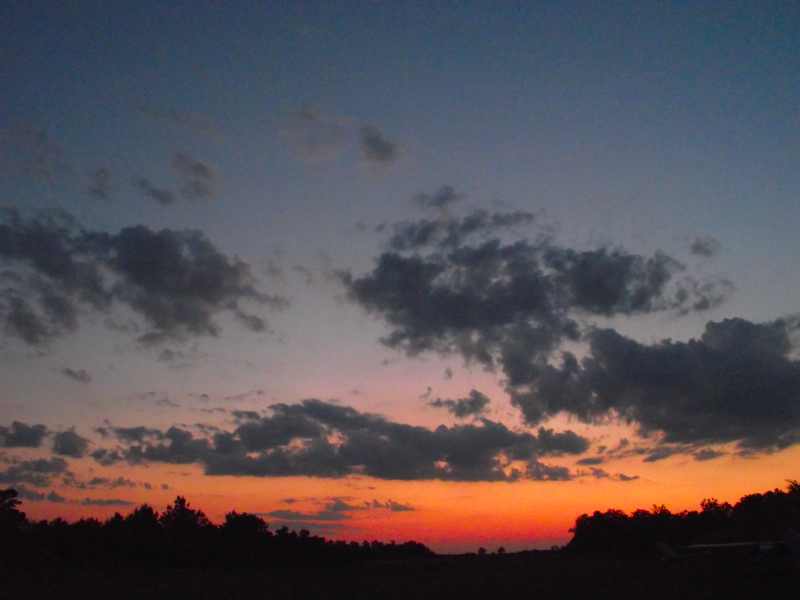 Out at the Eastern Shore Centre, I bopped on over to Barnes and Noble for a copy of Sky at Night Magazine while waiting for the Sun to get low enough for me to give passersby a peep at the crescent Moon and the three bright planets on display. Before long, dark shadows began falling and I got Agnes on her wedge, which I pointed roughly north, but did not obsess about. 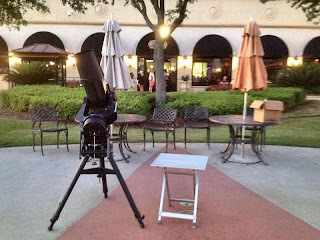 The good old PSAS is a small club, but we were able to muster six telescopes for this occasion, just enough to handle the curious little families that began to wander by the fountain area where we were set up. One and all, they wanted to know if this was SOMETHING SPECIAL. I told ‘em we’d soon be giving them good looks at the Moon and Saturn, which caused quite a stir. I hoped I’d be giving them good looks. Beyond collimating on Polaris, I’d never looked through this scope. “Pretty Moon or a custard pie?” that was the question. Well, hell, the images looked as good as those any other 8-inch SCT, including Celeste, would have yielded under similar conditions. The Cassini Division was easy to see and so was some banding on Saturn’s disk. Mars gave up detail despite his shrinking size. Venus was a sharply defined crescent that literally tugged at my heartstrings, bringing wistful memories of gazing at her glowing face from Mama and Daddy’s backyard. I was convinced this was the beginning of a beautiful friendship. No doubt the RV-6 will still get plenty of time under the stars with the older kids, but the C8 is definitely the IT girl for the little folk. The excellent (Byers) drive made observing with her a joy and the height of her eyepiece was just right for all but the wee-est of the wee brigade. Did I miss the go-to of the CG5? Nope. At this venue we were limited to the Moon and bright planets by light pollution, and even at the public schools’ Environmental Studies Center, where we do two public events a year, “deep sky” means “M13, M42, and maybe M35,” all of which your old Uncle can still find the old fashioned way. Best moment this Astronomy Day? One skeptical appearing young woman went to Agnes’ eyepiece for a look at Saturn after some urging by her buddies. She looked, and she looked, and suddenly she began screaming with joy—literally. One of the mall cops actually came over to see what was wrong. There was nothing wrong. This person had just had her eyes opened in a new way. Don’t like doing public outreach? I suspect you’d have changed your mind if you’d been with me on this night. Anyhoo, I was back home at Chaos Manor South by 9:30 p.m. I left Agnes in the front parlor temporarily while I rounded up that consarned bottle of Yell for a wee nip, muchachos. I figured I probably ought to haul her back upstairs, but I didn’t, not right away. In fact, I put her fork/OTA back on the wedge so I could admire her. Not bad, not bad at all for a patched together Frankenscope of an SCT, I reckoned. No, not Steve Zodiac and Doctor Venus’ Space City, Alabama’s Space City a.k.a. “Rocket City,” a.k.a. “Huntsville.” I try to keep the subject of the little old Astro Blog from Possum Swamp resolutely on the subject of astronomy, amateur astronomy, but I do sometimes wander a little afield, mainly to the subject of space, or, more precisely, the manned space program. I’ve been following NASA since I was knee high to a gator, and I find many if not most amateur astronomers are big advocates of manned space exploration. If you’ve been reading this blog for a while, you’ll recall I have reported on the state of the U.S. space program a couple of times over the last couple of years, mainly to rake the Administration over the coals on the subject. Maybe it is now time for an update—or would be if there were anything much to update. Nothing has changed, not for the good, anyway. 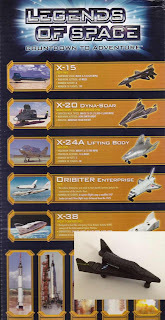 The decommissioning of the Space Shuttles just underlined that we now have no manned spaceflight capability. Supposedly that is coming in the form of those vaunted private spaceflight initiatives, but little has rolled out yet despite claims of lots of wheel-turning. In other words, the private space companies have not yet got as far as Project Mercury did fifty years ago, at least not as far as the Mercury orbital missions. Mojave Aerospace Ventures’ manned SpaceShipOne has completed suborbital flights. Will things get any better any time soon? I doubt it. The other day, NASA made noise about getting to Mars by 2030, but I find that laughably optimistic when we can’t even get to the ISS at the moment. Sure, we went from Explorer I to Tranquility Base in a little over a decade, and technology is much better today, but we now lack the political will and consensus to do stuff like that. Hell, I don’t think we’ll be able to get back to the Moon in 18 years, much less put men on Mars. What are the prospects for a change in the space policy of our Administration? In an election year, especially an election year coming off The Great Recession, a time when Obama’s opponents are all making huge noises about SPENDING LESS, I don’t see much hope. Especially given the fact that surveys reveal Mom and Pop America believe NASA consumes somewhere around 25% of the national budget instead of the just over .5% they actually get. How about the current candidates for the Republican Presidential nomination? Romney made great sport of Newt Gingrich’s call for the building of a permanent manned Moon base. Does Mitt really think going back to the Moon is a big joke? Or was that just a way to get in a dig at his opponent? It’s hard to know what he thinks. Gingrich? I don’t agree with him on much, but he is right all down the line on space. For better or worse, though, he doesn’t have a prayer of getting the nomination much less winning the Presidency. That’s the story on manned spaceflight. How about unmanned? I hate to be right all the time, y’all, but you will recall I warned the unmanned-is-better crowd they would soon be out of the frying pan and into the fire, too. So it has come to pass. In addition to the dismantling of manned spaceflight, huge cuts in unmanned programs are now underway. When the space program’s been at low ebb in the past, I’ve always found myself drawn to revisiting its past glories. Maybe that’s not a bad thing. Seeing the greatness—and the occasional not-so-greatness—is instructive, and relearning what can be done with the crudest tools does give me hope for the future. If we could get to the Moon 40 years ago with spacecraft made with stone knives and bearskins, we—or somebody else—can set sail on that great dark ocean again someday and keep going. Anyhoo, what better place to relive the heady days of Mercury, Gemini, and Apollo than The U.S. Space and Rocket Center in Huntsville? Contrary to what some folks think, it is not a government run deal. Well, actually, it is, but not by the federal government. 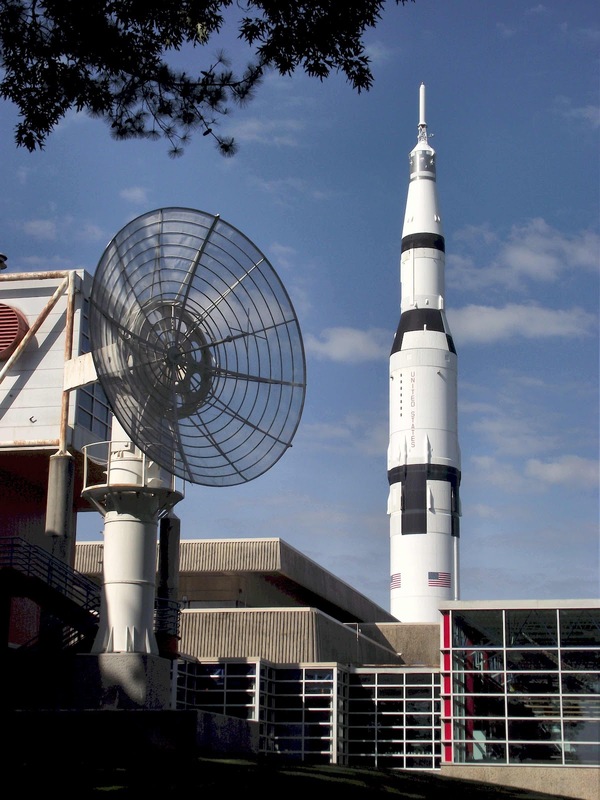 The State of Alabama operates both the Center’s museum and Space Camp, which is based on the same property. While it is not run by NASA, the Center has always received much cooperation and support from them. As well it should, since The Space and Rocket Center and Space Camp are doing a bang-up job educating the public about outer space these days. Not that the place hasn’t had its ups and downs. There’ve been some years of doldrums, and one bad period at the end of the 1990s when it was so deeply in debt it looked like it might not survive. I always liked the Space Center, but I had to question the wisdom of letting their real Saturn V (the Dynamic Test Vehicle used by NASA for vibration effects tests) rust away on its side outdoors in the rocket park while spending oodles of money on a mockup that would sit on its tail fins out front. But it all worked out. The towering fake Saturn may not have been the obvious way to spend so much money (almost 9 million bucks), but out there looming over the Interstate it sure is eye-catching and can be seen for miles. Obviously it caught the eye of donors, since just a couple of years ago the Center completed a huge “rocket hall” in which their fully restored real Saturn V now resides. “The Davidson Center for Space Exploration” is beautiful and is much like the similar facility at Kennedy Space Center. How far back do me and the Space Center go? To shortly after Miss Dorothy and I got hitched. She was appalled, simply appalled, to learn I had never been there. I was, too, but I had never had anyone to go with before. Miss D. set about to rectify the situation, and we have been doing Huntsville every year or three since. There was a short intermission while D. was battling cancer, but it has once again become her annual birthday treat. So it was that Miss D. and I hopped in the 4-Runner and headed north one Friday morning some weeks ago. The drive is not that bad, about 6-hours, the same time it takes to get to Atlanta—or The Chiefland Astronomy Village. The only bad part? That cotton-picking boring stretch between Possum Swamp and Montgomery. It is flat. There is nothing to see. It seems to take forever. 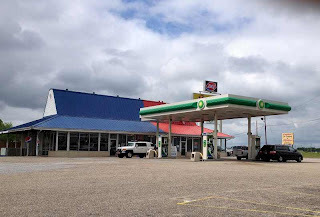 When we got to Montgomery, Miss Dorothy and I stopped at the good, old Stuckey’s on its outskirts for lunch, a tradition with us for dang near twenty years. 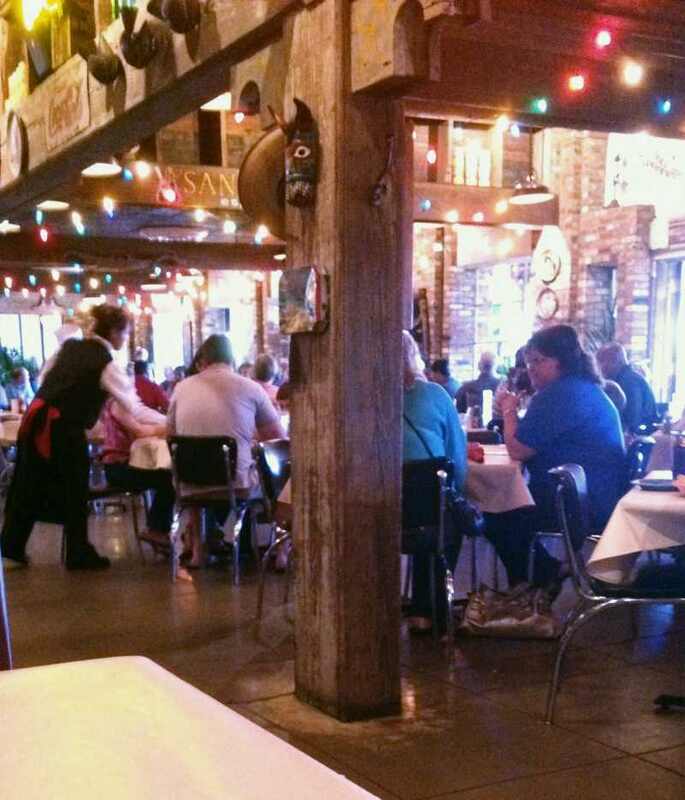 After that stultifying stretch of I-65 even Stuckey’s is heaven. Chili dogs consumed and gee-gaws browsed, it was on to Birmingham. After you pass Montgomery, the land begins to change, rising to foothills, and the scenery is much more interesting. It seemed like no time at all before we were waving goodbye to Vulcan’s statue receding in the rearview mirror. Our destination, Huntsville, was soon upon us. Years ago, we used to stay at the Space Center Holiday Inn. It was a real relic from the glory days, with plenty of pictures of Redstone Rockets and Mercury capsules on the lobby walls and a bar called “The Galaxy Lounge.” The spirits of the giants of the 1960s were a palpable presence. When I looked out of the corner of my eye, I seemed to see The Seven sitting at the bar. Then, a couple of years back, when the economy really hit the skids, the Holiday Inn went downscale to Holiday Inn Express, the cocktail lounge was closed, and the once uber modern motel began a dowdy old age. Searching for an alternative, D. remembered she and Miss Beth had stayed at a nice La Quinta years ago when they’d visited, not long before D. and I met. We decided to try that motel, which (we thought) was right across from the old Holiday Inn. How was it? It was immediately obvious it was not four-star. It was not three-star. It was two-star. But it was OK. Reasonably clean, with friendly staff. The room was not much different from what we are used to in Chiefland, Florida. Except there was neither fridge nor microwave. That was OK with me since there was a nearby icemaker with plenty of ice for the Rebel Yell. On the way back to the motel we noticed another La Quinta, which turned out to be the one D. and B. had stayed at those many years ago. We decided it didn’t look much better than the one we were in, and that as long as we were not awakened by the sounds of junkies and johns in the parking lot, we would be fine where we were. We did notice a nice looking and new Best Western next door to Rosie’s, and we will likely stay there next time—and be within walking distance of all that food and beer and margaritas. The evening was quiet and restful. I spent a few minutes browsing the Cloudy Nights bulletin boards—the La Quinta’s wi-fi was surprisingly speedy—had a nightcap of Yell, and drifted off watching Monsters and Mysteries in Alaska on the dadgum Discovery Channel on the room’s brand-new flat screen TV. Next morning we were up and out reasonably bright and early. After a little of the motel’s (OK) continental breakfast, we were off to the Center, which was just a few minutes away. When you get there, have your camera ready, because as you walk up to the entrance of the original building, you will encounter a splendid photo op: the faux Saturn V rising over the Center with a NASA tracking dish in the foreground. 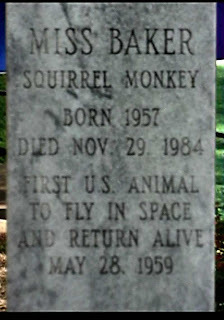 Before you go through the doors, stop and look behind you and you will see the grave of Miss Baker, one of the monkey-nauts who rode Jupiter Cs into the unknown in the late 1950s. 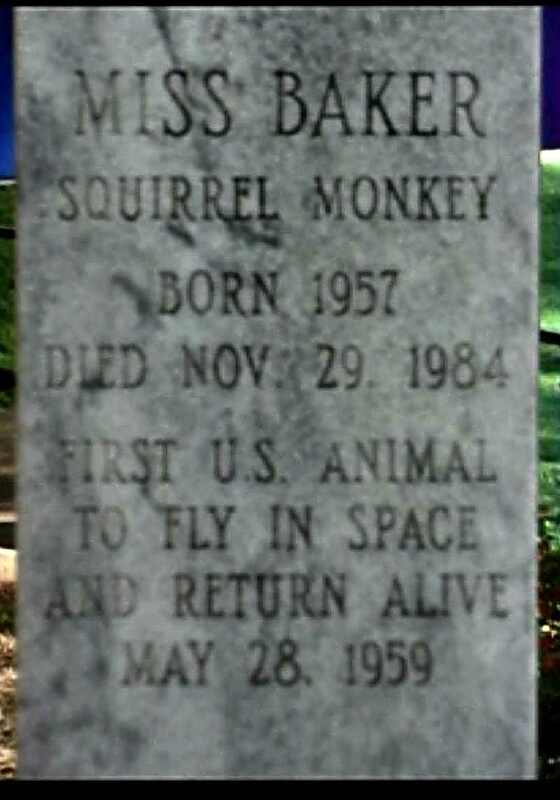 I always like to spend a few minutes paying my respects to brave Miss B., who lived a long life for a little squirrel monkey, nearly thirty years. Inside, the first thing you will encounter is the big gift shop, and it is a good one, muchachos. I browsed around a bit while Miss Dorothy got our tickets, but decided to leave the shopping till we were almost ready to depart. I intended to buy lots of SPACE STUFF and didn’t want to carry it around all day. The Center has an IMAX theatre, a nice one, and we always make time for the show if it is of interest. One of the films playing this time was Hubble, and while we didn’t know a thing about it, it sounded good, natch, and we got tickets for that, too. The movie would not run till eleven, so we had a couple of hours to wander around, which was about right. The older complex is dwarfed by the new rocket hall, but it’s still plenty big, and is packed with mucho cool stuff; everything from a Gemini (pronounced “Geminy,” young folks) capsule to a whole V2. The big draw this time, however, was the Von Braun exhibit. 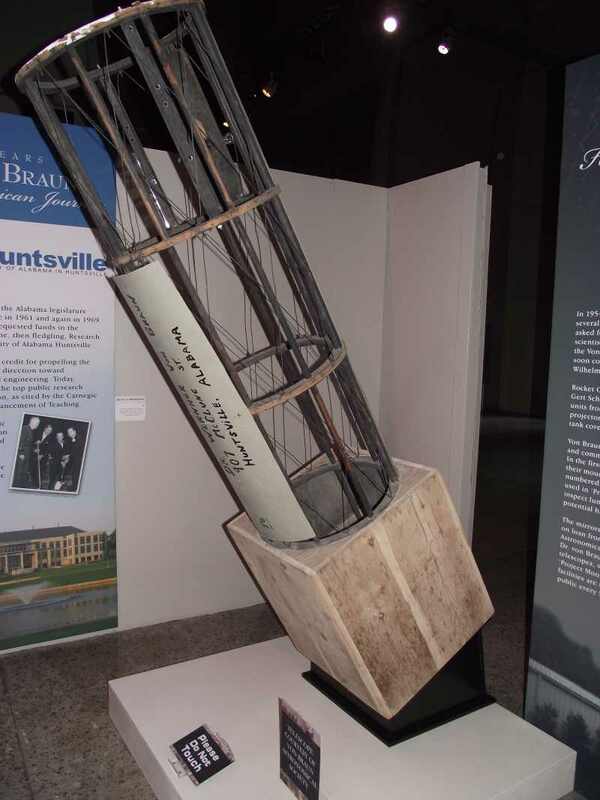 Its designers have done a good job of telling the story of Wernher Von Braun’s American years, and especially his Huntsville years, and have some impressive items on display. The Center has always boasted a recreation of Von Braun’s office filled with original items and looking as if The Man’s just stepped out, but that was now supplemented by a replica of his living room at home. What’s playing on the vintage TV set? Why, Lost in Space, of course. The displayed documents and journals are fascinating, and I was particularly taken by a meticulously drawn star map done by Von Braun (it doesn’t feel right to call him “Wernher”). The documents and the rest of the exhibits paint a good picture of America’s top space scientist, but don’t tell us too much about his work in Germany and on the V2 as a weapon. Not surprising, perhaps, since his conduct during World War II has grown more controversial post Cold War. Even more intriguing for Unk was a little display over in a corner, the tube of a 12-inch Newtonian telescope (looked to me like; the primary was not present). It is skillfully crafted of wood, and while the poster accompanying it concerning Von Braun and the Von Braun Astronomical Society (“The Rocket City Astronomical Association” back in The Day) is vague and confusing, this may have been Dr. Von Braun’s personal telescope. When Miss D. was able to drag me away from that, we continued our tour of the original Space Center, but did not tarry. There was still the rocket hall, The Davidson Center, to cover. To sum up, the Von Braun exhibit was very good, the permanent displays were in great shape, and all the center personnel, including the Space Camp cadets who serve as docents, were friendly and knowledgeable. 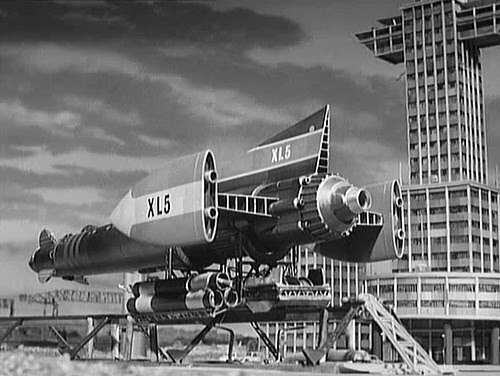 Incidentally, Space Camp was originally conceived of by Dr. Von Braun. Before visiting the Saturn V, there is the outdoor rocket park to see. Not much has changed there in years, but that doesn’t mean it is not incredible. There’s a towering Saturn IVB and a whole array of U.S. ICBMs, IRBMs, and NASA boosters. Hell, there is even a freakin’ V1 buzzbomb, and that has just got to be rare. 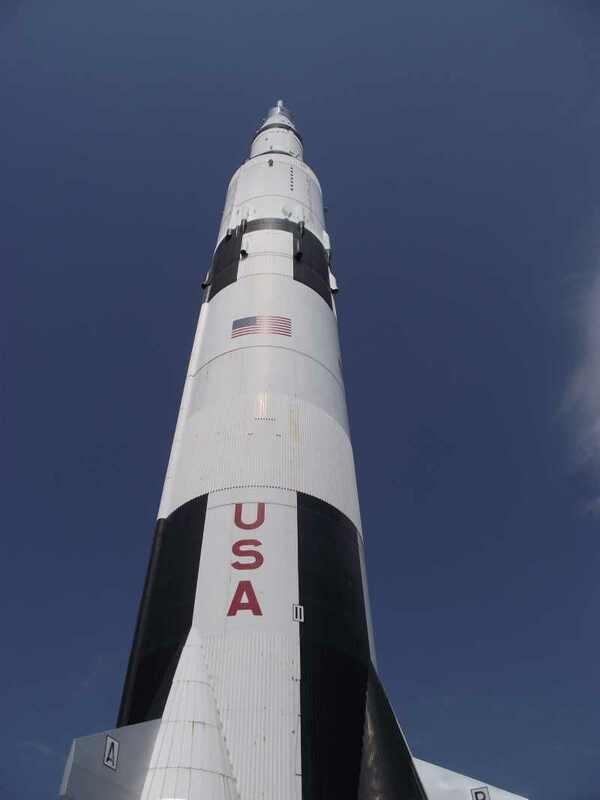 One of the most valuable and impressive things is the park’s array of Army anti-air/anti-missile rockets and missiles (Redstone Arsenal, where The Marshall Space Flight Center is located, is an army installation). There’s a Nike X, a Nike Zeus, and much more. I said “not much had changed,” but one thing has. In addition to the Saturn V having moved indoors, the park’s Titan II has disappeared. 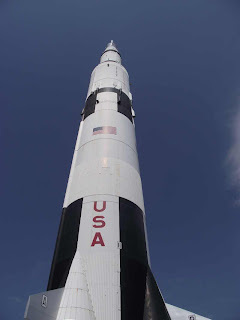 The Titan II was used both as a U.S. silo launched ICBM and as a space launcher for Project Gemini, and the one at Huntsville was not just any Titan, but one I knew, a hangar queen I’d trained on at the U.S.A.F. Ballistic Missile School in Texas many a long year ago. The Association of Air Force Missileers urged the Center to apply for a grant from them to help restore the Titan, but this was in the Center’s bad old days, and they were not interested. I hope the old warhorse has gone to someone who can give it a good home. The Saturn is ringed with plenty of interesting to astounding exhibits, including a Lunar Module, a Moon Rock, and the restored Apollo Mobile Quarantine Facility, which was the modified Airstream trailer in which the returning crew of Apollo 11 was housed till NASA was sure they hadn’t caught any Moon bugs. A depressing thing? Last time I was at the Center there were plenty of Constellation exhibits. They are all gone now. By the time you’ve finished a few laps around the Saturn V, you will be ready for a sit and a bite to eat. Miss D. and I sure were and headed back out across the rocket park to the rear of the main facility and the Center restaurant, “The Rocket City Grill.” This was formerly known as “The Lunch Pad” (yuk-yuk), and was renamed in an effort to make it seem a little more upscale, I guess. It is a little fancier now, I reckon. It still has the old-timey burgers, fries, and dogs, but also serves rather good salads today. Salad? Feh! Naturally, Unk chose the Stargazer Burger with Bacon. What has not changed? 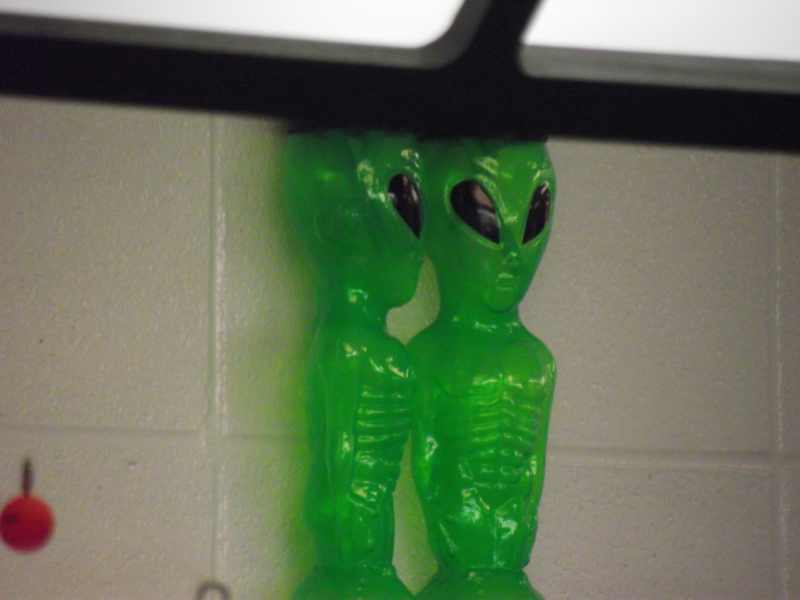 My little alien friends still watch me in the form of weird-looking drink bottles. Do these little suckers follow me everywhere? Next destination was the IMAX theatre for Hubble. This 2010 film is in part about the space telescope, but its main focus is the Shuttle repair missions that brought the crippled Hubble to life and which kept it going over the years. I liked the movie, though I was disappointed to learn the film, which was originally in 3D, would be shown flat. On that towering dome of an IMAX screen, it almost looked 3D, though. Yeah, I liked Hubble, but its chronicle of the Shuttle’s greatest triumphs left me feeling almost as blue as those pictures of the spacecraft being ferried to their final resting places did a few weeks later. One last stop, the gift shop. Buying space stuff is almost as much fun as buying astro stuff, and me and Miss Dorothy went hog wild. The fact that we’d economized on the motel made us feel a little less guilty than we otherwise might have. We loaded up, y’all. What did Unk get? Bunch of stuff, but, most of all, a cool space toy. 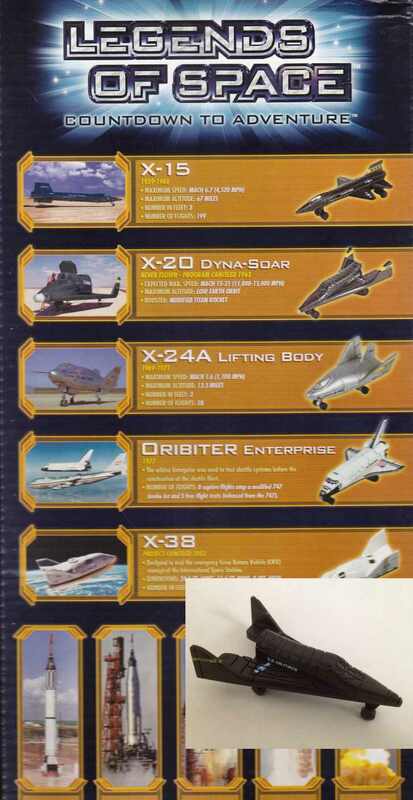 You know I still like space toys, and even in these latter days you can still run across some cool ones. Like the little set of plastic spacecraft that spoke my name. It was not your everyday box of plastic spaceships, either. It included not just a Titan II and an Atlas F, but—get this—a Dyna Soar! And that was it. All that remained for this trip was a couple of good steaks at Huntsville’s Longhorn restaurant, a restful night of cable TV, and a bearable trip home. It had been a great visit, maybe our best ever, and we hope to make it back next year. Reliving all those marvelous days thanks to The U.S. Space and Rocket Center did leave me a little sad, yeah, but mostly it gave me hope, muchachos. It’s only been 40 years since our greatest triumphs, those triumphs were achieved in a little over a decade, and we could easily do it all again. We could do it even better today given the tools we have now. We and our leaders just need the will—there’s that word again—and the courage.